The top shelf of the Trapper Arne inventory displays some of these large, productive JUMBO traps. The JUMBO trap looks just like its predecessor, the Trapper, but it can hold twice as many crayfish inside. Built with sturdy hardware cloth, it is also surprisingly rugged. The JUMBO is escape resistant, making this trap a good candidate for overnight sessions especially while well baited. 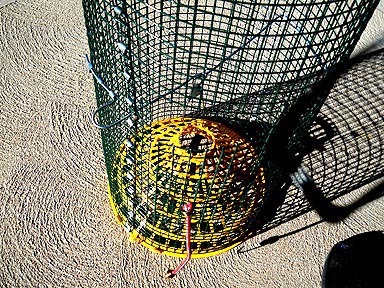 Thanks to its size, this trap is best suited for lakes where the crayfish population is high. 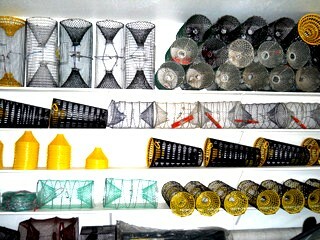 In the picture, below the shelf with a row of JUMBO traps, you will also see other popular traps such as the JACKPOT, the TRAPPY and its larger cousin the Trappy XL. When used in an unusually well populated lake, Trapper Arne once had difficulty lifting a Jumbo into his boat. It contained no less than 80 large crayfish. The record catch however is 127 crayfish in one Jumbo trap caught at one of our favorite crayfish lakes in Northern Arizona. Meet my grand daughter Annika holding two of the Jumbo traps. She was with me when I tested the Jumbos in my favorite crayfish lake on the Apache Indian Reservation in Arizona. She liked what she saw. A friend suggested that maybe the trap will attract more crayfish if the funnels were painted black or dark. I tested one trap that I equipped with black funnels, but the result was the same. All Trapps caught almost the same amount of crays. The JUMBO trap is made from vinyl covered hardware cloth with a 14 gauge centered bait clip wire adding stability to the trap. At each end is a 11" diameter entry funnel made from polyethylene which will outlast us all. 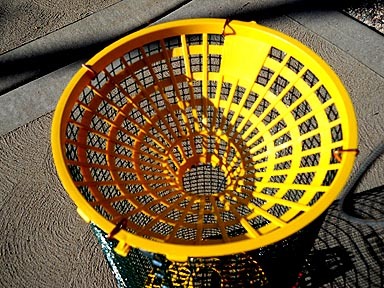 The funnel is of escape resistant design, and with proper amount of bait, will keep attracted crayfish inside for all night sessions. The JUMBO trap is a light weight trap but it quickly sinks to find its place on the bottom of the lake. A handy opening for baiting and emptying the trap of its catch is positioned in the middle of the long side of the trap, kept closed with a bungee. Measurements: length: 24" - diam: 11" - weight: 2 lb. 2 Oz. - Mesh size: 1/2" - trap entrance 2". Here's the JUMBO with all the other traps. In front a JUMBO upright next to one lying down. In the background you see a JACKPOT next to a TRAPPY XL. In front to the left a TRAPPY lying down. As a comparison I placed a regular Milwaukee beer can to the right in the picture. Compared to the old Trapper crayfish trap, the JUMBO can hold twice as many crayfish - and often does! 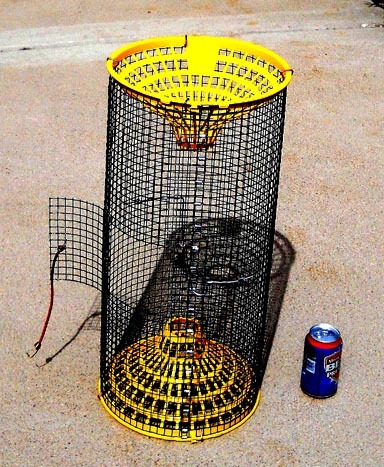 The diameter of the JUMBO funnel is 11" and the length of the trap is 24". For years it has boggled my mind that, the larger a trap, the more it not only can hold, but the more it seems to attract. Why? You tell me! For lakes with modest amounts of crayfish, the JUMBO trap is unnecessarily large. 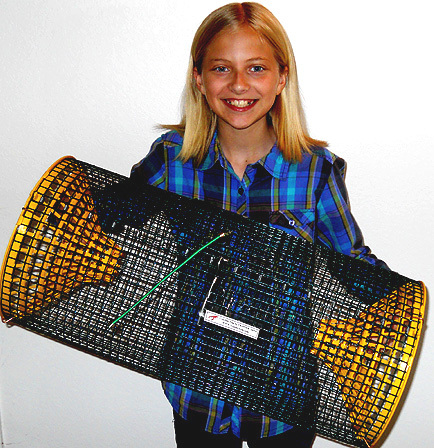 The smaller traps may be better to use in lakes with modest crayfish populations. 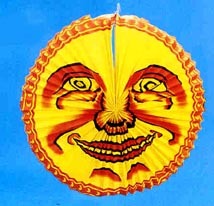 A close-up of the JUMBO trap shows both the bait opening and the escape resistant nubs at the small end of an entry funnel. Although the JUMBO holds twice as much as the old TRAPPER, it only looks somewhat larger in size. 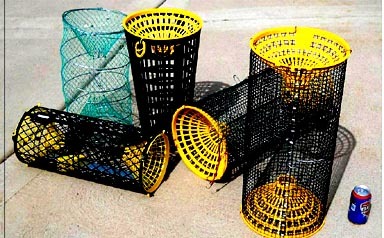 Be aware of local size regulations for crayfish traps when using large traps. 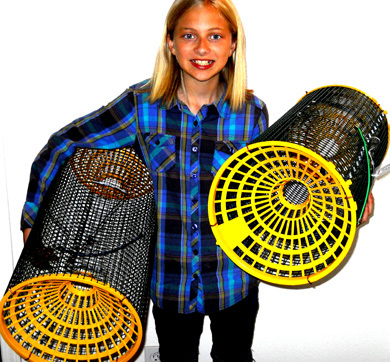 Do you want to jump to the ORDER PAGE right now to buy the JUMBO Crayfish Trap? YES!